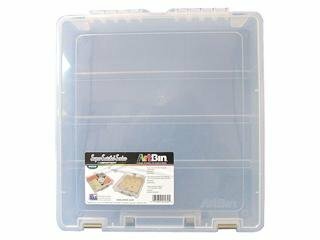 ArtBin containers are perfect for storing and organizing supplies. Super Satchel 1 Compartment Translucent- Transparent polypropylene storage box with a non-divided interior, sturdy back hinges and 2 integrated front latches which securely keep the lid closed. Measures approximately 14"x 3.5"x 15.25.